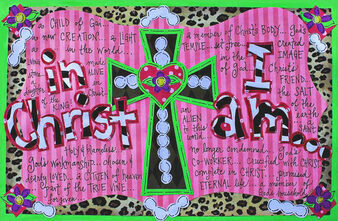 Please contact Peggy Osborne for tax exempt sales: peggyposborne@yahoo.com. Please use dropdown menu to choose the placemat style and adjust quantities in your shopping cart. Please make a note of your pick up location. 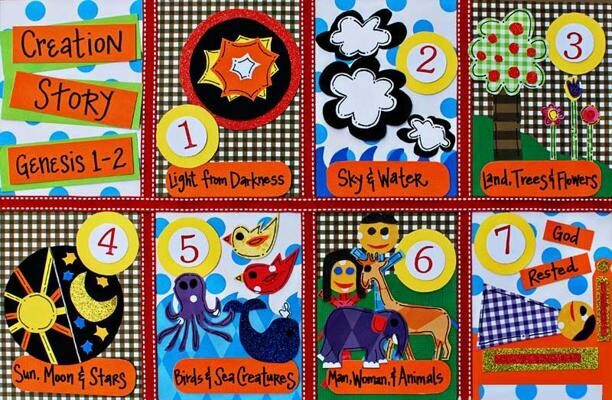 By integrating two of the most popular methods (The Bridge and the colors of the Wordless Book) of sharing the Gospel with kids, this placemat gives you a great visual of how to explain each part of Salvation to children of all ages. 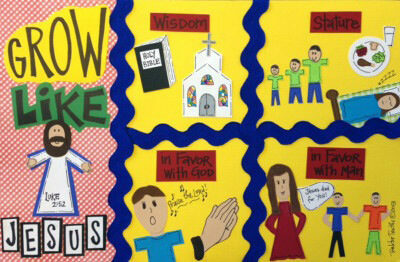 And if they already know the Gospel, use this mat to teach your kiddos how to share Jesus with their friends! Let’s help our kids GROW UP to be like Jesus! Luke 2:52 shares the four areas that Jesus grew: in wisdom, in stature and in favor with God and with man. This fun, brightly colored mat gives some great examples of how our kids can grow in each of those four areas! Even non-readers can learn from the pictures. 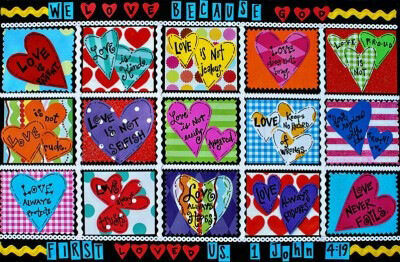 This fun, brightly colored mat highlights the verse from 1 John: “We love because He first loved us.” The rest of the mat is dedicated to focusing on all of the attributes of love from 1 Corinthians 13. If you are focusing on a different "Fruit of the Spirit" each month it is a great idea to make February the month for LOVE! Whatever month you decide to make "LOVE" your focus, this mat will support your discussion at the dinner table. Jesus is our perfect example of Love! Love is not easily angered. 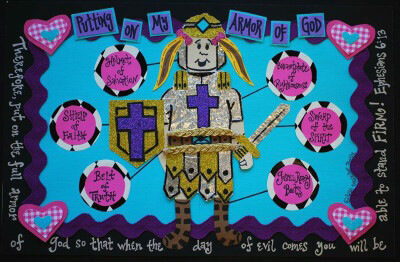 What better way to send your kids out into the world’s battlefield than with the Armor of God? 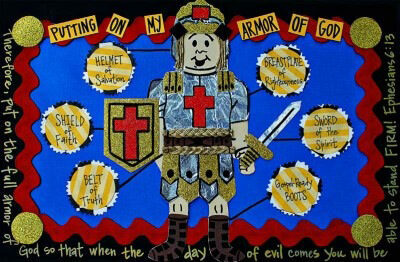 Use this mat to teach your children each piece of the Armor that God gives us in Ephesians 6 and help them see that God has equipped them to handle anything that comes their way! Great for any boys in your life! Girls need armor too! Let’s help our girls be prepared to face their battles by teaching them all the parts of God’s Armor in Ephesians 6 and showing them that He can handle anything that comes their way! 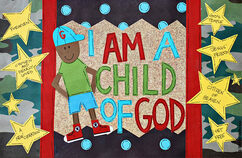 Inspired by the Attributes of God Placemat, this mat will help kids memorize the different names of Jesus. 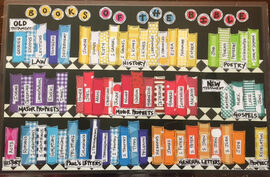 Using brightly colored, simple pictures it illustrates each name. Even the youngest minds can learn TRUTH! 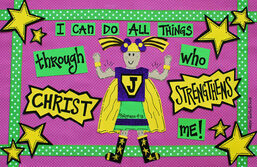 Your children will enjoy these Super Hero inspired mats that will remind them who our ultimate Super Hero is...note the J for Jesus! He has the power to help our kids in any circumstances…nothing is too big for HIM! 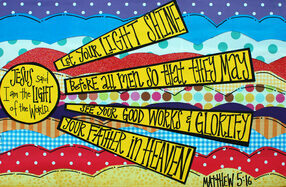 This fun mat reminds us of those familiar verses. It is a great springboard to talk about how we can be lights for Jesus in a very dark world. Your kids will enjoy the brightly colored design! One of the first Bible stories our kids usually learn early in Sunday School is how God created the world! 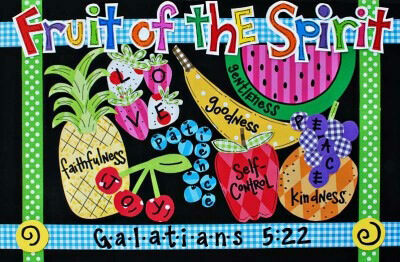 This fun, colorful mat summarizes each day of creation using simple pictures that appeal to children. While it is great to know the ordered days of creation, what we really hope for our children to grasp is that God loved them so much that He made and gave them a beautiful world and that His creation of them was very personal. What a loving God we serve! 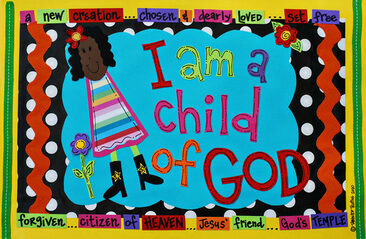 One of the most fundamental things we want our kiddos to “get” is WHO GOD IS. Knowing the Bible stories is great but if they don’t understand the character of God in each story, they miss out. 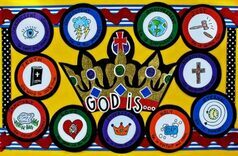 This mat illustrates and explains some of the most important Attributes of God. 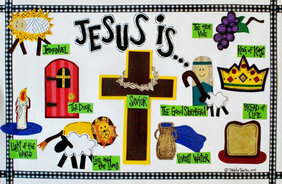 By using the big theological words with simple definitions and symbols even the youngest minds can grasp these concepts! OMNISCIENT: He sees and knows everything. OMNIPOTENT: He is ALL powerful. JUST: He is always fair. MERCIFUL: He forgives our sins. HOLY: He is perfect and clean. SOVEREIGN: He is King of Everything! LOVE: He gave us His Son! TRUTH: His Word is 100% true. The world is constantly telling our kids that in order to be someone they have to be smart, funny, athletic or pretty…and the list goes on. Let’s combat those lies with this mat that explains what GOD really thinks about them because that is what is most important. 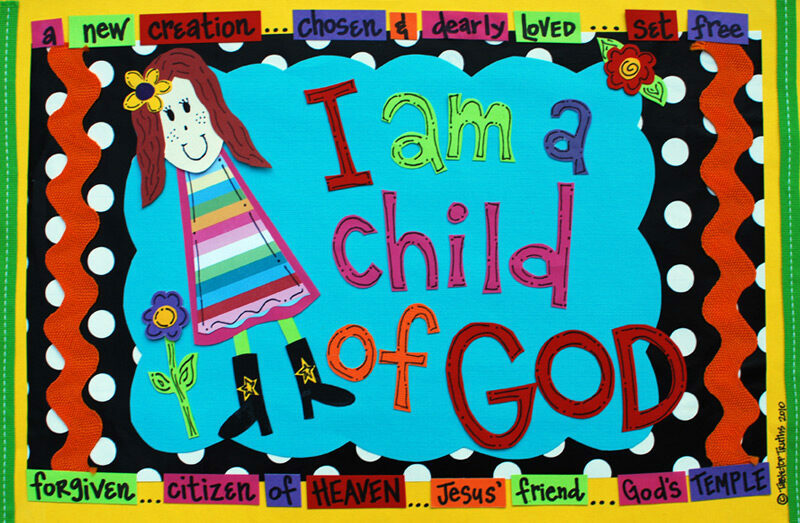 This mat has specific quotes from scripture to help even the youngest to see that they are children of God and He thinks they are the greatest! 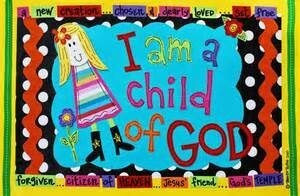 Our kids need to see who they are IN CHRIST every day. Whether your older children use these at the table or tack them up on their bathroom mirror, these mats are full of scriptural truth. They will remind them that, regardless of what the world says, Christ sees value in them just as they are! Girls will enjoy the fun pink and animal print design!. 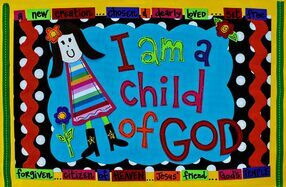 Our kids need to see who they are IN CHRIST every day. 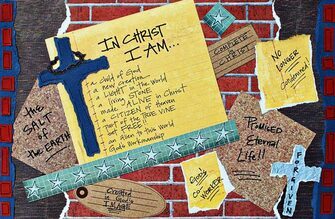 Whether your older children use these at the table or tack them up on their bathroom mirror, these mats are full of scriptural truth. They will remind them that, regardless of what the world says, Christ sees value in them just as they are! Boys will like the rugged, graffiti style design. Do your kids know all of their books of the Bible? Use this mat at mealtimes and they will master them before you know it! 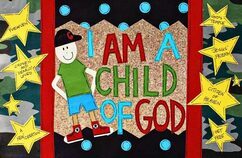 Help your kids memorize their books of the Bible with this fun, colorful mat and equip them with a skill they will use for life!